Hans De Breuk, Breukeltje, van Breukelen is the famous goalie that won the European Cup in 1988. The guy that knew which side Igor Belanov would shoot his penalty at and letting him know he knew, with his ‘finger gesture‘. It’s a Dutch thing. At the time of this photograph I met Hans at the KNVB where he was Technical Director of the Orange team. Hans is a very pleasant guy, very open and warm. Always asking for your opinion, even when it concerns the next national coach. It’s a quality you like to see more often in the world of football. 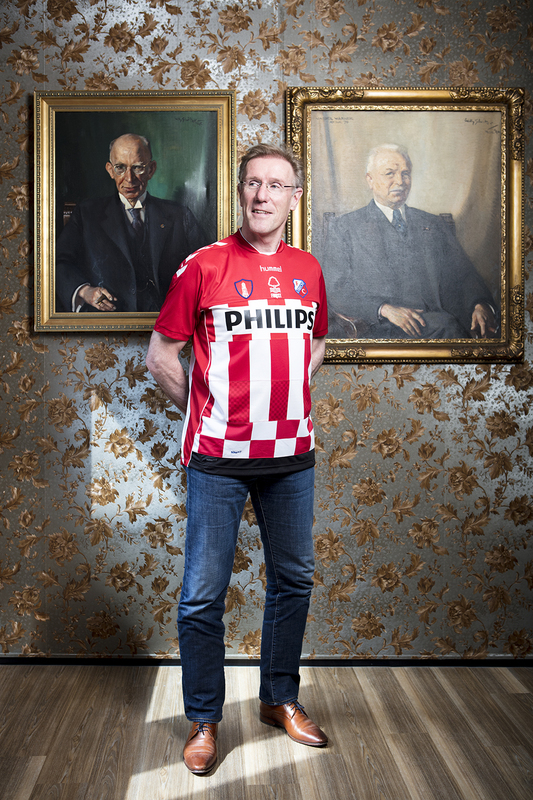 We’ve made him a PSV, Nottingham, Utrecht shirt, all in red and white with the iconic Philips branding of PSV, the club where Hans has earned most of his success. Currently Hans has moved on to his next step in his career and we wish him all the best.